Another Lentil Patty/Burger Recipe I know! 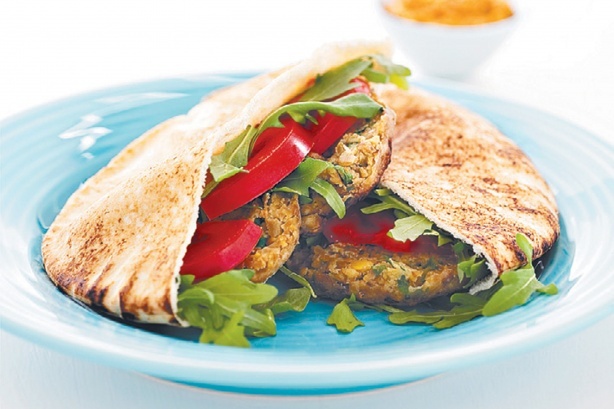 This Spicy Lentil Patties with Pita Recipe is another variation on a theme. This one is not that hard to make, you don’t even need a food processor. What’s more it’s healthy and Vegetarian. I have had this recipe for 5 years and have only tried it once. Try it on the family and see how you go. Enjoy! Place brown lentils in a bowl and mash roughly. Add mild curry powder, cumin seeds, ground coriander, plain flour, parsley and egg. shape mixture into eight round patties. Heat some oil in a non-stick frying pan over medium heat. Lightly dust patties with extra flour. Tdd to the pan and cook for 3 minutes on each side or until golden brown and cooked through. Remove them from the pan, drain on paper towel and halve each patty. Cut along one end of 4 pita bread pockets. Fill each pocket with sliced tomato, baby rocket and a couple of patty halves. Serve with yoghurt.